Chalice, silver. Circular foot tapers to cone-shaped stem seamed at mid-stem. Stem flares out above mid-point to flattened spherical body, in-turned at rim. Interior of chalice is double-walled with sloping, gilded sides. 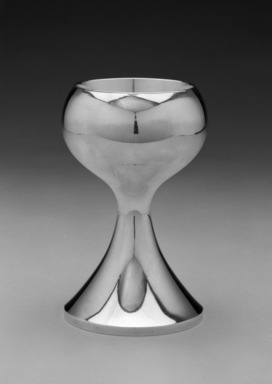 On bottom of chalice, about 1" above foot rim, is a disc concealing interior of stem, with domed winged central element concealing detachable nut. CONDITION: Gilding on interior somewhat worn. One small dent on side of interior.